The prime suspect sought in the deadly attack on a Berlin Christmas market — a 24-year-old Tunisian migrant — was the subject of a terrorism probe in Germany earlier this year and was not deported even though his asylum bid was rejected, a senior German official said Wednesday. The suspect — who went by numerous aliases but was identified by German authorities as Anis Amri — became the subject of a national manhunt after investigators discovered a wallet with his identity documents in the truck used in Monday’s attack that left 12 dead, two law enforcement officials told The Washington Post. Meanwhile, a clearer portrait took shape of the suspect, including accusations that he had contact with a prominent Islamic State recruiter in Germany...Amri was the subject of a terrorism probe on suspicion of “preparing a serious act of violent subversion,” and he had known links to Islamist extremists, authorities said. Why a failed asylum seeker with such links and no passport was walking German streets is “the question 82 million Germans probably want an answer to,” said Rainer Wendt, Chairman of the German Police Union. 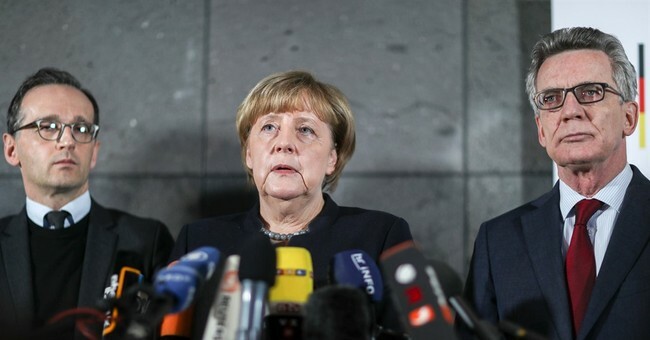 Successive mishaps in a separate case suggest the flaws in Germany’s antiterror effort run through the entire length of its security apparatus, from its long underfunded domestic intelligence to its police work and prison system. In October, a police SWAT team stormed a flat in the eastern German city of Chemnitz in search of Jaber Albakr, a man suspected of planning a suicide bomb attack on a Berlin airport. He managed to flee on foot, partly because the officers’ tactical equipment was too heavy for them to catch up, security officials said at the time. Inside the flat, officers discovered large quantities of homemade TATP explosive. Mr. Albakr was later caught in Leipzig—not by police but by Syrian refugees who restrained him and handed him over. Once he was detained, the Leipzig prison staff couldn’t immediately locate an interpreter to question him. When the prison’s psychologist finally interviewed him, she decided Mr. Albakr wasn’t a suicide risk. Two days after he was detained, Mr. Albakr’s lifeless body was found hanged in his cell. Tuesday’s atrocity highlights an aspect of the refugee crisis to which I have been trying to draw attention for over a year: The main threat posed by the West’s mass acceptance of immigrant populations from sharia cultures is not that some percentage of the migrants will be trained terrorists. It is that a much larger percentage of these populations is stubbornly resistant to assimilation. They are thus fortifying sharia enclaves throughout Europe. That is what fuels the jihad. It would be foolish to think it couldn’t happen here, too. To be sure, the infiltration of trained terrorists is a huge problem; even a small percentage would compute to thousands of jihadists within the swarms of migrants. Alas, that is a secondary concern. The bigger threat is the enclaves. These are not merely parallel societies in which the law and mores of the host countries are supplanted by Islamic law and Islamist mores. Even residents who are not jihadists tend to be jihadist sympathizers — or, at least, to be intimidated into keeping any objections to themselves. That turns these neighborhoods into safe havens for jihadist recruitment, training, fund-raising, and harboring. They enable the jihadists to plan attacks against the host country and then elude the authorities after the attacks. In short, the jihad succeeds not just because of the jihadists, but primarily because of the swelling, assimilation-resistant communities. They are the incubators. Click through for additional examples from Paris to Brussels. Western multiculturalism fetishists for years scolded anyone who spoke of this problem, or promulgated the "myth" of so-called "no go zones" -- until reality intruded too obviously to maintain the charade. There are countless innocent victims caught up in the horrific bloodbaths in Syria and other areas of that deeply troubled region, which is a humanitarian tragedy of epic proportions. Americans must not close our hearts to the plight of these people. But we also must not accept the reckless naivety that is getting people killed around the world. Fashioning a sensible and constitutional regime of "extreme vetting" will require a thoughtful and clear-eyed debate, but it cannot move forward if critics continue to insist that being extra careful about entrants from certain parts of the globe is nothing more than rank, baseless bigotry. People are right to be skeptical and cautious, as the latest awful attack in Germany reminds us.